(NaturalNews) Children with insufficient levels of vitamin D are more likely to have hardened arteries as adults, and more likely to develop cardiovascular disease, according to a study conducted by researchers from the University of Turku, Finland, and published in the Journal of Clinical Endocrinology & Metabolism. Worldwide, childhood deficiency and insufficiency of vitamin D is widespread. "There's a lot of data showing that vitamin D insufficiency is bad for health," researcher Markus Juonala said. "We found evidence that it is connected to artery health as well." As scientists continue to uncover all the important roles that vitamin D plays in the body, attention has turned to the vitamin's role in maintaining cardiovascular health. Prior studies have linked low vitamin D levels to increased risk of heart attack and stroke. The Finnish research was conducted on 2,148 participants who were between the ages of 3 and 18 at the study's start in 1980. Participants underwent regular physical exams, including having their vitamin D levels, lipid levels and blood pressure measured, and having their diet and smoking status assessed. At age 45, participants underwent ultrasounds to assess the thickness of their arteries, including the carotid artery in the neck. Arterial thickness, also known as carotid intima-thickness, is considered a marker of the arterial hardening that can lead to higher risk of cardiovascular disease, heart attack and stroke. The researchers divided participants into four groups, based on their average vitamin D blood levels as children. Participants in the lowest quartile (with an average level of 15 ng/ml) were nearly twice as likely to have thickened carotid arteries as people in the other groups, even after adjusting for other cardiovascular risk factors. Vitamin D blood levels of 40 to 80 ng/ml are considered ideal, according to the Vitamin D Council. "Our results showed an association between low vitamin D levels in childhood and increased occurrence of subclinical atherosclerosis in adulthood," Juonala said. "The association was independent of conventional cardiovascular risk factors including serum lipids, blood pressure, smoking, diet, physical activity, obesity indices and socioeconomic status." The body synthesizes vitamin D naturally upon exposure to sunlight; it can also be found naturally in a handful of foods. Health experts once thought that the vitamin's only role was in maintaining bone health. Now, research has shown that vitamin D play an important role in preventing cancer and autoimmune diseases, and perhaps other chronic diseases as well. 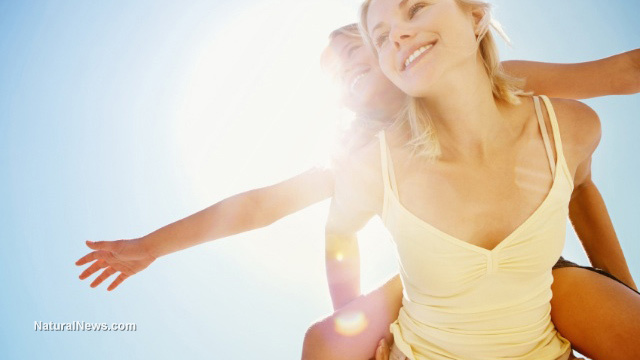 An October 2014 study in the journal Diabetes, led by researchers at the Telethon Kids Institute in Perth, Western Australia, uncovered yet another important health benefit to spending more time in the sun: When exposed to ultraviolet radiation, the skin also produces nitric oxide gas, which helps slow weight gain and regulate metabolism. This may reduce the risk of obesity, a major risk factor for cardiovascular disease, diabetes and cancer. "These findings support the idea that a healthy lifestyle should include time outside in the sunshine, not only for exercise but also to benefit from sunlight on skin," said David Ray of Manchester University. But the skin cannot synthesize either vitamin D or nitric oxide when blocked from ultraviolet radiation by clothing or sunscreen. Experts recommend that, to get enough vitamin D, light-skinned people get at least 15 minutes of unprotected sun exposure to the face and hands per day. People with darker skin or living in locations farther from the equator might need two to three times that amount.